Recent versions of OpenSCAD is capable of rendering objects/assemblies to images. Below it is an anti-aliased version of the same scad file. I used the common trick of generating an oversized image and downscaling it. If you update your project renderings using a makefile/script I don’t consider it much of a hassle considering the improvement in image quality. Also at least on my laptop with the currently relativity simple scad file rendering is still fast. In case you are wondering the assembly is a new CNC mill I’m designing. Which hopefully is an improvement over the last design. Unlike the old design the new one is being pre-assembled in openscad, hopefully preventing having to print parts that only fitted together in my head, saving both time and plastic. 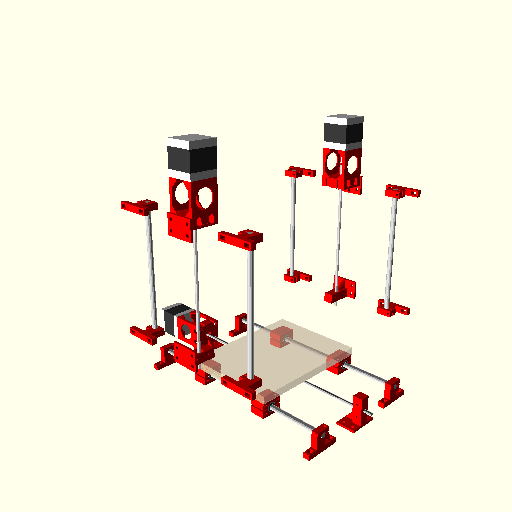 Both designs are hosted on Cubehero, my favourite site for sharing designs on.